In a world where a lot of games for children are based on fast paced action (example: Hungry, Hungry Hippos), Briarpatch’s Beddy-Bye Game aims to indulge a child’s more methodic side. Although it won’t actually put your child to sleep (shucks! ), it will entertain and delight each player, whether child or adult. The object of the game is to collect pajamas, a bottle, and a teddy bear in order to make sure baby is happy in bed. But watch out! If baby gets fussy, playful, or sleepy, you may need to use one of your collected items in order to placate the little one. With exceptionally easy to understand rules, quick gaming speeds, and bright colors, the game seems to excite children that enjoy playing games. 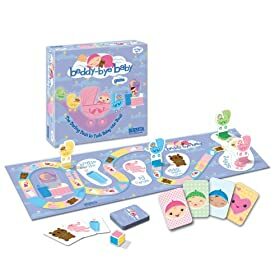 Stepping away from the traditional memory games and taking a break from the classics, like Candy Land, Briarpatch’s Beddy-Bye Game will enchant and amuse every member of the family.